Whether it's to cut calories, explore new flavors, or just make due with available ingredients, recipe substitutions are an inevitable—and fun!—part of the cooking experience. Whether it's to cut calories, explore new flavors, or just make due with available ingredients, recipe substitutions are an inevitable—and fun!—part of the cooking experience. And after trying dozens and dozens of swaps over the past year or so, we've even come to prefer a few "replacements" to their original counterparts. When it's time to satisfy that sweet tooth, consider these healthier substitutions for baking fats. Fruit for fat? Yeah. For sweeter recipes like brownies and fruity muffins, this swap is a definite winner. Applesauce offers the same consistency as butter or oil, but with zero fat, a little extra natural sweetness, and fewer calories (though it will add a touch more sugar). It even works in boxed mixes! Try it in some delicious blueberry muffins for a twist on classic flavors. Doubting this swap? We did, too—until we whipped up some dark chocolate avocado cookies. Mashed or pureed avocado has a similar texture to butter with more heart-healthy fats and a smooth, rich taste that pairs perfectly with chocolate. We're looking forward to trying this swap in many batches of brownies and cakes to come! 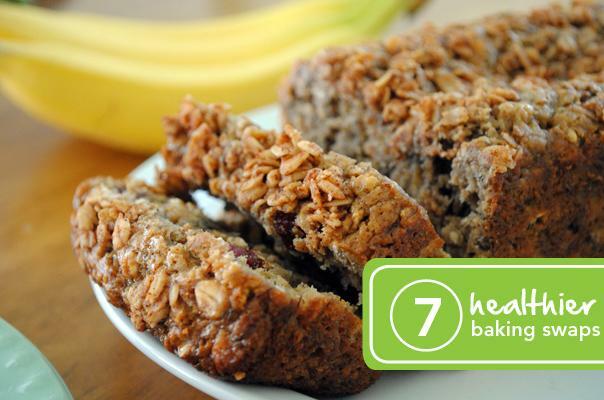 This one's similar to the avocado swap but a whole lot sweeter, ripe bananas add potassium and fiber to our favorite recipes. It's a proven star in sweet stuff, too (banana bread, amiright?). And when combined with other baking fat swaps, it's easy to make an oil and butter-free banana bread as delicious as traditional recipes. Prunes don't always get the best reputation when it comes to taste and versatility, but 1/3 cup of prune puree can easily replace a stick of butter in denser baked goods. It's also great for dark and dense cookies, brownies, and even cakes. Ricotta—even the whole milk variety—is a lighter option than cream cheese when it comes to calorie count. And it bakes into an excellent cheesecake with a lighter, fluffier texture. Rich in omega-3 fats and with a distinct nutty flavor, ground flax seed is one of the most surprising fat swaps out there. Mix three tablespoons of ground flax with one tablespoon of water for a paste that subs in for every tablespoon of oil or butter. Ground flax is perfect for recipes that already have a strong nutty flavor. And here's a fun fact: One tablespoon of ground flax plus two to three tablespoons of warm water makes a "vegan egg" and can be used as an egg replacement, too. It's legendarily sweet, but marshmallow fluff actually contains fewer calories and less sugar than conventional frosting. Bonus: having leftover fluff for some super quick s'mores.